Ocean Canada (oceancanada.org) is a cross-country research partnership dedicated to building resilient and sustainable oceans on all Canadian coasts and to supporting coastal communities as they respond to rapid and uncertain environmental changes. 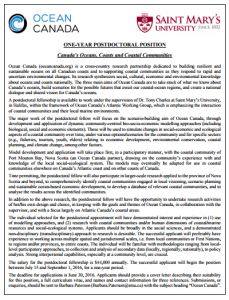 A postdoctoral fellow is available to work under the supervision of Dr. Tony Charles at Saint Mary’s University, in Halifax, within the framework of Ocean Canada’s Atlantic Working Group, which is emphasizing the interaction of coastal communities and their local marine environments. The deadline for applications is June 30th, 2016. 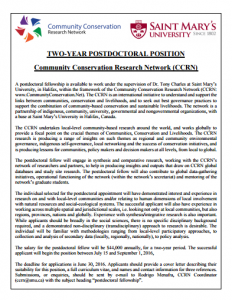 A postdoctoral fellow is available to work under the supervision of Dr. Tony Charles at Saint Mary’s University, in Halifax, within the framework of the Community Conservation Research Network (CCRN:www.CommunityConservation.Net). The CCRN is an international initiative to understand and support the links between communities, conservation and livelihoods, and to seek out best governance practices to support the combination of community-based conservation and sustainable livelihoods. The network is a partnership of indigenous, community, university, governmental and nongovernmental organizations, with a base at Saint Mary’s University in Halifax, Canada.